Something totally awesome happened to me just as I was on the run-up to completing the manuscript for The Thousand Emperors: I got an out-of-the-blue request from my German publisher, Heyne, to write the foreword to someone else's novel, at very short notice. But not any novel, oh no. Only Arthur C. Clarke's City and the Stars. Not only that, it's by far the best paid fifteen hundred words I've ever written. Ok, yes, it's in German but, still, talk about feeling honoured; although it feels a little old-fashioned now, it was hugely influential on me as a writer - something I didn't realise until I reread it for the first time since my early teens in preparation for writing the foreword. When I say it had to be written fast, I mean fast. 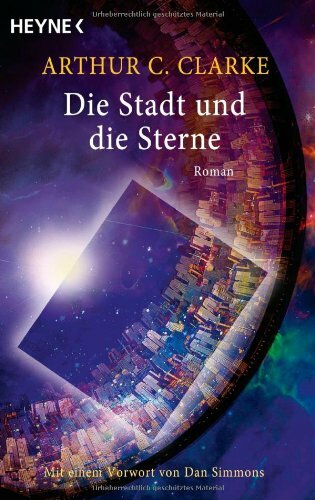 The publication date of Heyne's reissue of Die Stadt und die Sterne is July 11, just a couple of weeks after I handed the finished foreword in to them. It was translated, I think, within about twenty-four hours. It did seem unusual to me to get such a request at such very short notice, but a little bit of detective work reveals a possible explanation. I checked Amazon.de to see if the edition with my foreword was there, and it was...but on the cover, it said (in German) foreword by Dan Simmons. I scrolled through the Look Inside! preview and found my foreword there. So I'm guessing Mr Simmons perhaps had to pull out of writing the original foreword at very short notice, or something like that. Luckily for me, assuming that's what happened. You can see the foreword here, on Amazon.de, and in rather more detail, here, on Heyne Verlag's own website. In German, of course. If I can get permission from Heyne to post the English version of the introduction here at some later date, I will.